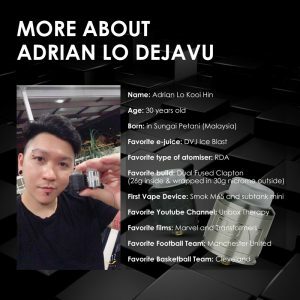 Adrian Lo Kooi Hin, better known in the vape community as Adrian Lo Dejavu (Malaysia, 1988), is a Malaysian Youtube vape reviewer and designer. His first creation, the DJV RDTA was a vaping hit. 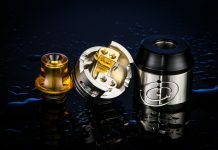 His brand is now launching the DJV RDA, a dripping version that also includes a bottom feeder pin. 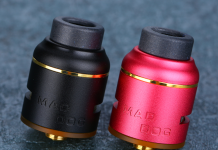 The DJV RDTA was the most wanted RDTA for a while, did you expect such a big success? I never expected that! In the beginning, I just wanted to try to design an atomiser for cloud-chasing and vape-tricks. I was glad to see that everyone enjoyed vaping it! People really liked the central post filling from your first creation. What are you bringing out now to impress the vape community with your new RDA? Since many people don’t like RDTAs, I decided to make an RDA version of the original DJV RDTA. They both have a similar design. I increased the airflow while trying to keep a good flavour. The side airflow is now upgraded to 3 triangle holes and my watermark on another side of the DJV logo. Are you trying to satisfy flavour chasers more than cloud chasers with this DJV RDA then? What kind of build would you recommend for those purchasing your RDA? Any tips? Inside the packaging, we provided two fused Clapton coils. If they wanna keep it simple, they can build a 26g 6wrap dual coil or a 30g parallel 5wraps dual coil. This RDA design is only for dual coil options. 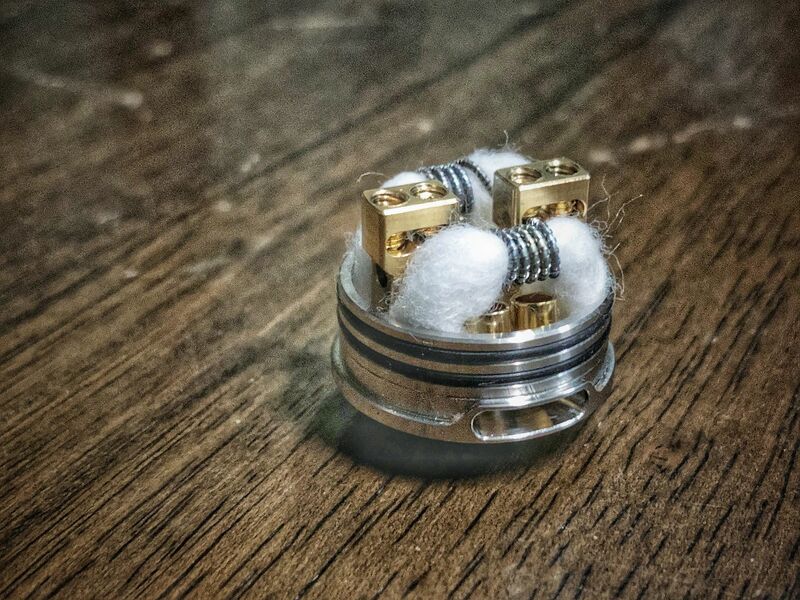 If they are using nichrome, then they can try a 40g 5 wraps dual coil. 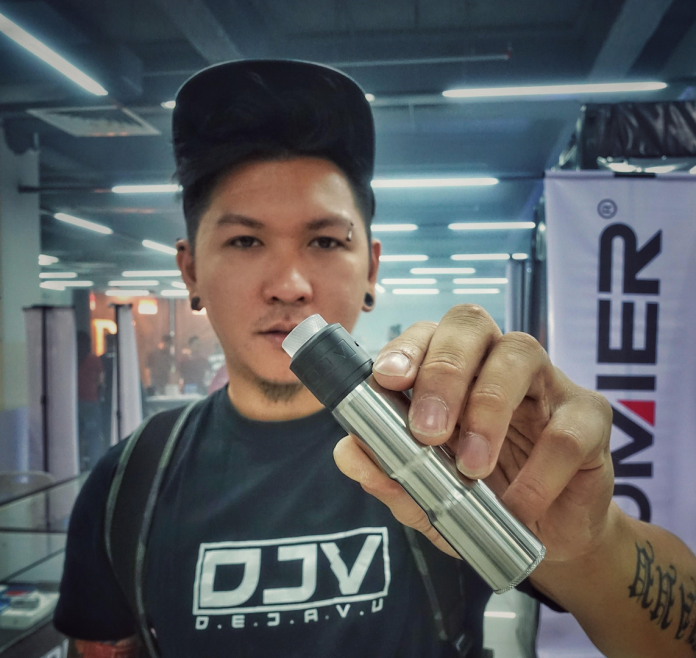 Many people know you from your YouTube channel, but how does a vape reviewer from Malaysia end up designing vape gear? You tried and you succeeded… Could you ever imagine that your hobby would become a job? Definitely yes. I am not the type of guy who can be sitting in an office looking at a screen all day long. Even if they paid me a fortune, that’s not for me. So I’d rather use my time to work on my hobby. The vape industry is constantly evolving. With so many products being released every week, what’s the key to designing outstanding vape products? Depends on the users… I think about what they want every day and try to create something different compared to others. I have many new DJV products coming soon! Will we see a DJV mod soon? Maybe a Mech mod? I have a mech mod and box mod coming out next month. I also have some other projects in mind like my first pod mod device and creating urban clothing. Many people wonder which manufacturer is backing your work, can you tell us who? Vaping is very popular in your country, Malaysia. But recently hundreds of vape shops were raided. Do you think vaping is safe in your country?